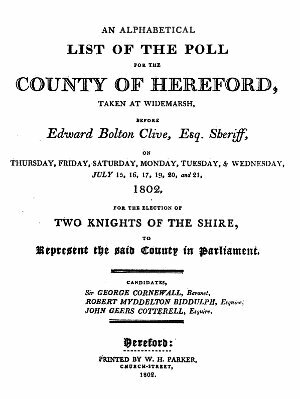 An Alphabetical List of the Poll for the County of Hereford at the General Election of 1802 taken at Widemarsh before Edward Bolton Clive, Esq. Sheriff, on THURSDAY, FRIDAY, SATURDAY, MONDAY, TUESDAY, & WEDNESDAY JULY 15, 16, 17, 19, 20, AND 21, 1802, for the Election of Two Knights of the Shire to Represent the said County in Parliament. GENERAL STATE OF THE POLL. The original handwritten Poll Book is held at the Herefordshire Archive and Records Centre, reference B60/6. It covers the people in the Radlow Hundred in no apparent order so this is the Bosbury people found. This is what the original book looks like. The cover picture and General State of the Poll table shown above are from a printed book which listed all the voters in Herefordshire and is available on Google Books. The printed volume appears to have some errors. Just for information Cotterell’s election was declared void on 15 March 1803.